WEST LAFAYETTE, Ind. — The Purdue wrestling team resumes its season on Tuesday and Wednesday, traveling to Northwestern University for the 2009 Midlands Wrestling Championships, hosted by the Wildcats at Welsh-Ryan Arena. 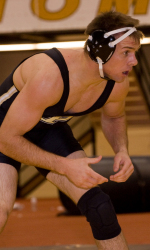 The Boilermakers have a trio of wrestlers preseeded for this year’s tournament as junior Luke Manuel is the No. 4 seed at 174 pounds, classmate Logan Brown is the No. 7 seed at 197 pounds and fellow junior Colton Salazar is the eighth-seed at 157 pounds. In the midst of another solid season, Purdue heads into the tournament sitting just outside the NWCA/USA Today Coaches Top-25 Poll, receiving votes. Manuel, Brown and Salazar all hold InterMat Top-20 national rankings in their respective weight classes as Manuel sits seventh in the nation, Brown is 12th, while Salazar is 20th. Fellow junior Juan Archuleta is the only other wrestler on the squad to hold a national ranking this season, moving up to 20th in the country at 141 pounds in the Dec. 15 poll before dropping out last Tuesday. The Boilermakers are 7-1 in dual competition so far this season, including a 4-0 sweep of the Purdue Duals last time out. Several wrestlers made career achievements, including Brown and senior 184-pounder Nick Corpe who both eclipsed the 200-takedown plateau and moved on to the all-time career leaderboard at Purdue. Fellow senior Nick Bertucci moved himself into a tie for 13th all-time at Purdue with his 17th and 18th career falls, while Manuel climbed to 11th in school history with a .750 career winning percentage. The 2009 Midlands Wrestling Championship boasts its usual extremely tough field, featuring 10 of the top-25 teams in the country and approximately 100 of the nationally ranked individuals in the latest polls. Among the several impressive teams on display will be top-ranked Big Ten rival Iowa and second-ranked national power Iowa State. Purdue hopes to put on its second straight impressive performance at Midlands, coming off its best-ever finish in 2008. The Boilermakers finished seventh in the team standings with 82.5 points as four wrestlers climbed the podium, led by Brown’s bronze medal effort at 197 pounds. He was an impressive 6-1 last year, besting a pair of nationally ranked opponents and scoring bonus points in four of his victories. Graduate Jake Patacsil was fourth at 149 pounds, while current redshirt A.J. Kissel was seventh at 184 and Manuel was eighth at 165. Bertucci and Corpe fell just shy of the placing rounds, losing in the round of 12 after impressive showings. The Boilermakers will field 12 competitors in this year’s tournament, including double weight entries at the four lower weight classes. Sophomore Matt Fields and freshman Cashé Quiroga are set to compete at 125 pounds, while junior Akif Eren and sophomore Bill Putman are slotted for 133. Archuleta will be joined at 141 pounds by sophomore teammate Jake Fleckenstein, and Bertucci is set to compete alongside classmate Sam Patacsil at 149 pounds. Salazar, Manuel, Corpe and Brown round out the list of Purdue’s entries. Tournament action will kick off Tuesday morning with session I beginning at 10:30 a.m. (EST), while session II will follow at 8 p.m. It will resume Wednesday morning with session III starting at 1 p.m., and the tournament will conclude with its championship rounds in session IV at 8:30 p.m. Session recaps and results will be available throughout the tournament at PurdueSports.com, and check the Purdue Wrestling Twitter Page for constant updates.